When I came home last night, I was delighted to find a package (because I’m a fan of gifts). What was in the package? 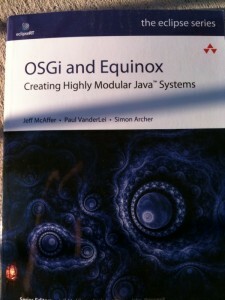 A brand spanking new copy of the Equinox OSGi book. In my biased opinion, this is best OSGi book on the market. I’ve had the honor to see the book evolve while it was written. Through that experience, the OSGi tooling at Eclipse (PDE) improved significantly. The authors were kind enough to nag inform me when things didn’t work the way they desired and I did my best to fix everything. The only downside, my last name was spelled wrong in the Acknowledgments section (will be fixed in second printing). So what are you waiting for, grab the book and play with the Toast example. If you want hands on training from the authors of the book and me, please attend our tutorial at EclipseCon! It’s not too late to register!